Inspiration for craftiness can come from anywhere really... 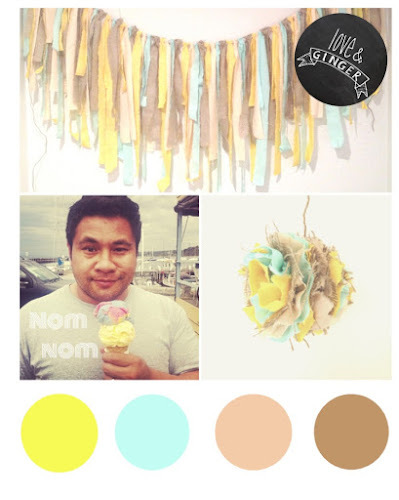 Thought I would share with you the inspiration for one of my garlands (selling here soon)! It came in the form of my brother-in-law/ cute man-child guiltily eating an ice cream on the harbour. Now, whenever i look at this garland it will make me think of ice creams by the sea... Like I needed to think about ice cream anymore than I do. Oh! and I'm happily reporting that the...ummm..."head injury" I suffered yesterday has not lead to the copious amounts of ominous possibilities that may have run through my crazy mind. Woohoo! Cest la vie! Live each day to the fullest! High jump with ankle tap!!!! !